I entered the Central Bus station in Jerusalem to get on the bus to take me home to Shilo. It was the evening before Yom HaZikaron (Memorial Day), a few hours before the sirens went off to signify the start of this most difficult of days. I admit that I find this day very difficult, as the feelings start to set in before the sirens, before the torches, and before the start of the ceremonies. I suppose it is very hard for Jews outside to feel as we do here. This pain, this hurt, this contemplation takes everybody back in time. We go back to the stories we heard as children, then we reflect on our days of youth in the face of terrorism and wars, we remember our days in the Army, then reserves, we remember the not to distant past, the last decade, years, months and finally days. We reflect our own experiences, our own battles, and wonder. We swell inside, sometimes smiling at the memories of our friends and families, and then fight to hold back tears because we miss them, and we know that this is not the end of the fighting. It is a day of intense emotions, to say the least. I looked around me in the crowded station, and as the thoughts started to cloud my feelings, I realized that I was living the dreams and prayers of so many before me. I was looking at Israel, at who we are, and how we get there. No ceremony, no Ultra Zionist speech, no Flag waving. I was surrounded mostly in a sea of olive drab uniforms, with a rainbow of berets on their shoulders. The pins and unit ID’s on their uniforms shined proudly. They smiled, they laughed, they grabbed each other like they haven’t seen one another in years, but in reality it was only a few weeks. They are all so young. Standing out was the amount of kippahs, as much as a spectrum of colors as the berets, like never before, but not separate from the non observant, together with all, no barriers, just pure camaraderie and dedication and strength, what strength. I went in to the Synagogue to pray and observed Am Yisrael sitting together, all ages, all colors, from all over the world, Civilians, soldiers, guests. I am sorry that I cannot put use words to describe my feelings of pride, of strength. I was standing ten feet tall looking at our children, looking at our soul. I thought of all the Jews outside of Israel, especially those that enjoy criticizing and speaking against us, that I meet, and felt sorry they could not see this. My bus arrived and as I boarded, I realized the present I was just given, I saw Am Yisrael today in Eretz Yisrael today, in Medinat Yisrael today. Sure, we have our share of problems, maybe even more than our share, but over here in our little Israel, we are made of good stock, strong character, and a strong people. I smiled again, and felt even stronger, when I thought about how I was looking at the worst nightmare of our enemies, may they never sleep soundly again! In 1948, miracles occurred. One of those was that of the unity amongst the Jewish People throughout the world. A result of that miracle was the rebirth of the Jewish homeland in the State of Israel. Against all odds and numbers and with the blessings from above, the Jewish People once again governed their own state. In the following years, our state was bombarded with numerous wars and constant attacks, yet we progressed as a country and a people beyond ours, and our enemy’s wildest dreams. Despite the massive acts of violence meant to destroy our country and throw our people out of our land, we continued to grow. In 1967, another miracle occurred as we returned to the heartland of Israel, the cradle of our heritage and history as a nation. With our return to this heartland, our strength grew, as did our connection to Israel and one another. Once again Jews from all over the world could show their children the places that are mentioned throughout the Torah and our other Holy books. For the first time in over 2,000 years “seeing was believing”, and believing was real. All to often we take the luxury of freedom for granted. Today in Israel, I can take my family to Hevron, Shilo, Kever Rachel, and in the past, to Kever Yosef to name just a few. I can take them to our eternal connection to the Holy Temple that once stood in Jerusalem and pray at the Kotel HaMa’aravi. I can say to them, see, they are real. Our memories are too short, it wasn’t that long ago that we couldn’t do that. That simple luxury of showing our families our history and our connection to this land of Israel is on the chopping block now. We have just passed Holocaust Memorial Day followed shortly by our Memorial Day for our soldiers and victims of terror and then into Yom Ha’atzmaut, Israel’s Independence Day. That holy order of events that has brought us to where we are today must be part of all of us. Especially today when we face the prospects of a nuclear Iran which wishes to wipe us off the face of this earth and the remaining Arabs salivate at the opportunity to “cleanse” us from our historic heartland before getting rid of us entirely. The events, the attitudes and the goals of our enemies of the past have not changed, they have just been camouflaged with questionable rhetoric, readily swallowed by those who hate us and our own who know no better. 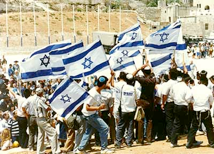 Every Yom Ha’atzmaut that comes around reminds them just how strong we are and can be and they know that we can, and G-d willing, will grow stronger. This year we must be even more vigilant as our enemies are growing and acquiring new friends. In the past Jews around the world responded to pictures and scenes of horror and terror. Seeing clips of Jewish mothers wailing over their children’s graves, buses split in two like over-ripened watermelons, evoked real emotion and action from our people. Organizations like Israel Bonds, Magen David Adom, UJA and the FIDF only had to show a presentation of a terror attack and an outcry was heard, the checks and funds poured in and action was taken. Our people, as usual, went above and beyond to help. Today, I would like to propose a change in attitude and action. No More Jewish Victims! This is not mere rhetoric – it needs to be the goal of every Jew throughout the world. We mustn’t wait for a horrible incident to occur before responding. We must prevent it from ever happening in the first place. We must learn from the past in order to brighten the future. As responsible adults and parents we watch over our children and families to protect them, we make sure to take measures to insure their safety, before, not after they run into harm’s way. Similarly, we watch over our own health, we try to exercise and eat right and when something hurts, we take care of it before it turns serious. That is the way it must be with Israel and the Jewish people. Israel is the greatest gift the Jewish people have at this point in our history - how can we put it in harm’s way? The signs of pain and danger are out there. Together, let’s prevent the problems from occurring, reoccurring or exacerbating. · We must not wait until we read and watch the scenes of Hezbolah rockets raining down on Tel Aviv. · We must not wait until we watch the news of the people in the South returning to the shelters from rocket attacks emanating from Gaza. · We must not wait until we see pictures of the Arabs of Judea and Samaria attacking innocent civilians and our families living there. · We must not wait to read the headlines of buses being blown up again. The time to prepare is now and we must unify and do whatever is needed to protect and defend our rights as a free Jewish People in our own land. Together, we can ensure that the necessary security equipment is in place to prevent these atrocities from occurring. And we must provide the emergency medical equipment to minimize the damage from the inevitable escalation of violence. Yom Ha’atzmaut is the celebration of this freedom – a freedom renewed for the Jewish People in our homeland 62 years ago - may it continue to be so. I eagerly look forward to hearing from you so we can protect and save innocent lives together. Marc Prowisor is the Director of Security Projects for One Israel Fund. Marc oversees all aspects of life saving security, first response and emergency medical projects throughout Judea and Samaria. One Israel Fund is working diligently to prepare and assist the security apparatus throughout Judea and Samaria. Through its many projects and close cooperation with the Security Chiefs and IDF command, it is the goal of One Israel Fund to achieve better results and to be ready to meet the new challenges that face these Jewish communities.